Campers may register for one or both weeks. After the first student registers, each additional sibling will receive a $50 discount if they register for one week and $75 discount if they register for two weeks. 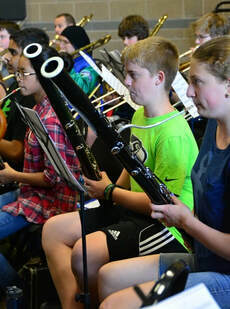 CYSO has perfected the music day camp experience. Musicians of all ages and skill levels who have played their instrument for over three years come together to inspire and be inspired by participating in both the full symphonic orchestra and the intimate lively art of chamber music. 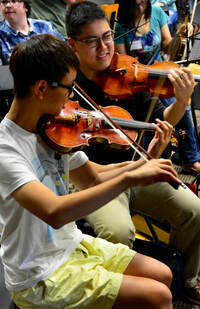 Instrumental sections are given professional coaching. Each camp week has its own theme that inspires that weeks music and activities. 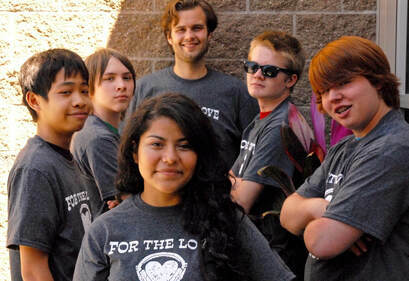 A free concert will be performed the Friday night at 7:30 p.m. of each camp week. The progress that is made in five days is phenomenal. No previous experience with CYSO is required. 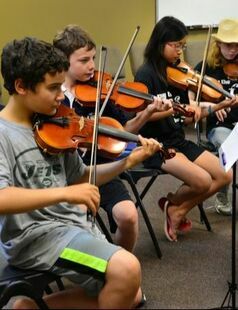 CYSO offers a half day camp for those string players who have played their STRING instrument for more than one year. The skills needed to play in a group are taught and practiced here where playing parts, listening to others, and watching a director are experienced. The art of creating music bigger than ones self is appreciated by students who participate in this program. Our music director has indicated summer sounds is right for you. Friday Night Concert - 7:30 p.m.